Social media and digital tools are great for both finding and sharing images online. We’ll cover two types of image tools; online photo storing and sharing sites such as Flickr that allow you to upload lots of your own photos, and sites like Instagram that are designed for sharing rather than storing. Online photo sharing sites have numerous advantages over keeping photos on your hard drive (although they are not without disadvantages and shouldn’t be considered foolproof storage). They make it easy to share pictures and give you additional features for organization such as tags and search. This has benefits for both the photo owner and those of us who want to view or use images. Access controls let you control who can see or download which photos, and licence controls let the owner feel more secure about sharing images while users can feel comfortable downloading them. To use upload photos on Flickr, you’ll need a Yahoo!, Facebook or Google account. If you don’t have any of the above and don’t want to set one up, you can still use Flickr as a fantastic image discovery tool. Go to Flickr. 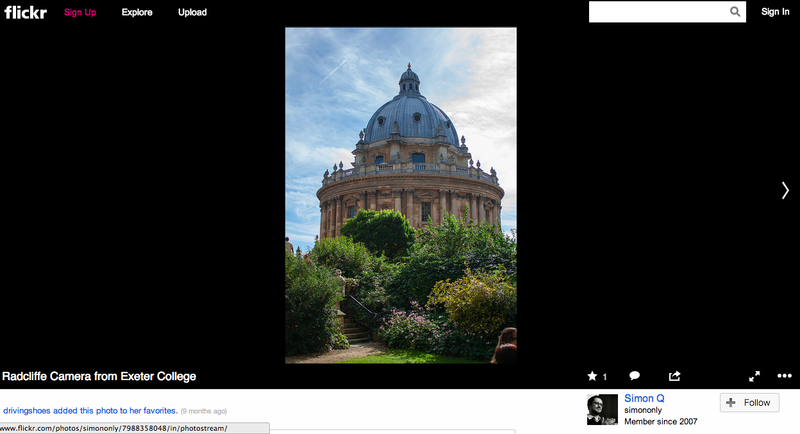 Use the search box or the explore option to find an image that you’d like to blog about. Experiment with different search terms, and see how they change what results you get. Note the features of a Flickr image. You’ll see the image right away. Below that on the right-hand side you’ll see the username of the photo’s owner. Sometimes the owner will have added additional information such as date or type of camera/lens. If the photo is in any groups or sets, they’ll be displayed on bottom too. Below this, you’ll find the photo’s tags. Depending on the photo settings, these may have been added by the photo owner or by other Flickr. Finally, you’ll see information about usage and licensing as well as privacy settings. You can download or share the image via the options at the bottom right of the image section (the share button looks like an arrow, and the download options are on the far right and look like three round dots). If you don’t want to create an account, spend some more time browsing images. Check out the Oxford Flickr Group, the Pitt Rivers Group (not officially run by the Museum, but the group works with museum staff), the Great War Archive Flickr Group and the Flickr Commons. Note the different purposes of these groups. The first is for enthusiasts; the second is centred on a particular institution and its work. The final group is a great example of using Flickr for crowdsourcing; the images have been contributed by people all over the UK as a part of the The Great War Archive. The Commons has a similar crowdsourcing purpose. If you don’t have or don’t want to create an account, skip on to ‘Exploring further’. If you have or want to create a Flickr account, do so now. Take some photos to upload, or upload one or two you already have – perhaps something that illustrates the work or research you do. Upload these into your Flickr account and tag at least one of the images with ‘23 Things for Research’ (read more about Flickr tagging). Please make sure that the images you upload are your own, or that you have received proper permission to share them. In addition to sites that let you upload and organize your images, there are also apps and tools that are designed for ‘one off’ sharing. Instagram, for instance, lets you share photos and 15-second videos straight from your phone or tablet, edit them with filters and captions, and share immediately with your followers (Vine also lets you share short videos). Take a look at the way American universities are using Instagram for some inspiration, explore the great things museums like the Smithsonian are doing with Instagram or think about the ways students could use Instagram to show the work they’re doing. If you’re interested curating images online rather than sharing your own, you might try using Pinterest, which allows you to ‘curate’ images – both those you upload and those you find online. It’s essentially an online bulletin board and can be great both as a personal tool for remembering images and bookmarks and as a tool for sharing links. We’ll be giving you guidance on a blog post in the next thing (Creative Commons and copyright), so sit tight for now! This entry was posted in Thing 17 and tagged Images by Alasdair Watson. Bookmark the permalink. Hi Liz, any privacy issues if (we don’t create an account on flickr, but) sign-in with our yahoomail account?